I will keep lookin for ya. Didn't find an Argosy for you, but, I found me a sweet little '68 Safari today that I did everything but get on my knees and beg. No sale.....yet. Thanks for the update and for looking in general, but when you tell your better half about this "sweet little '68 Safari" don't you dare blame finding it on me. Actually I sent her pictures and she loved it. Would like it for Mother's Day. I had not thought about blaming it on you,but, I will keep that in mind as a future excuse. Thanks for the idea. The trailer might be worth $2500, if you parted the trailer out, and sold the leftovers as scrap. How much do you figure the door, headliners, and windows are worth to people who are trying to repair their baby? I had a heck of a time finding an access door, and a main door lock. I might have paid that much just to get those two parts and be done with the search. haha Seriously, I almost bought a critter infested trailer for $500, just for parts. I decided against it because, I was afraid that I would end up trying to restore it. Whoa, what a story . . . sorta hurts to be stuck on having just the right thing. FWIW I probably paid too much for my new TT. Less than asking, but likely not enough to cover what it will eventually need. And even then this '90 is not as nice as the classic SS trailers circa 1965-1984 in some design aspects. Of which maybe 3,500 were made in that era. Maybe 2,500 of those still exist. Far fewer of the Sterling model I have. With which I am happy as despite potential problems it was still in very, very good original condition otherwise. I think that is what it comes down to. Best condition, and maybe not exactly what I want if I am otherwise close. Find something where the pluses outweigh the minuses. Thanks for the report. Trailer hunting is not for the faint-hearted given the investment we have made. (The money is another story). slowmover: Well, I'm not expecting to find a trailer that will end up being worth (in monetary terms) what it takes to make it really nice. I'm more realistic than THAT. However, there are limits, and this one was WAY over the line. mandolindave: I actually thought about the fact that the 4 pano windows are probably worth about $1200. 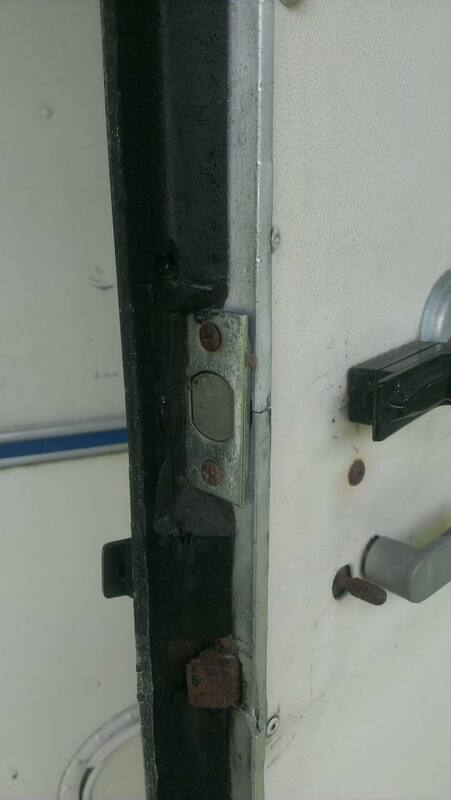 I don't think the entry door is worth much, in my laundry list of bad things you may have missed that it was cracked through where a full-sized deadbolt was jammed into it. The KT latch might be worth some parts, but it felt pretty junky. ...very sad story ... caveat emptor ... from the Latin, let the buyer beware. Looks like Nicholasville, Ky is a hot bed for Argosys. Check out the new thread by Crmpacer. While the seller listed the location in craigslist as Nicholasville, the Argosy was rotting in Mt. Vernon, KY. I suspect Nicholasville is where he lives, the Argosy was near his mother's house he said. Oh, and I was informed yesterday that the seller's phone number is now answered by a Verizon recording saying that the number is "changed, disconnected or is no longer in service." There are a lot of guys that think they are slick. Sometimes I think they have "well, I was dumb enough to buy it for $$$$, someone else will surely be dumber than I"
I think your offer of 2.5k was a fair price. You should be able to get a camp ready Argosy for $3000 not a distressed one. What a bummer, that guy is a crook! I have a 28' center bath Argosy (sorry, not for sale...), and will be gutting it, likely for a shell-off with a new custom interior since it is going to be my mobile workshop. When you find your ideal unit, I may have some parts for you if you need them. Also, I'll keep my eyes peeled in New England for another, and would be more than happy to inspect/take pictures for you should one be unearthed around here. Best of luck in your search, these really are great trailers! Don't judge an Airstream by the color of its skin!